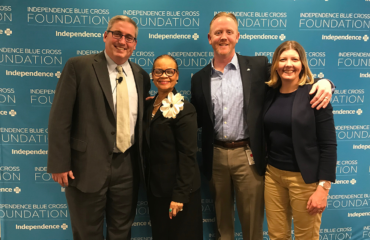 The Independence Blue Cross Foundation (Foundation) has committed $1.5 million in grants over the next three years to meet the increased demand for access to primary care and improve models of care in regional safety net health centers. The announcement follows a five-month needs assessment of the Foundation’s Blue Safety Net health center grant recipients, which was conducted by Drexel University’s School of Public Health. The Blue Safety Net is a network of 42 non-profit, privately funded health centers that serve more than 200,000 individuals annually across the five-county region and are a source of primary care for thirteen percent of the region’s uninsured individuals. The assessment determined the needs of these health centers and recommended two priorities for Foundation resources: to increase access to care through technology and to implement new models to improve care coordination. “Community health centers provide affordable, quality health care in medically underserved communities. We are eager to better understand how we can more strategically support their mission and steer them to increased sustainability during this time of unprecedented change in health care,” says Lorina Marshall-Blake, president of the Foundation. To eliminate barriers to care, some health centers want to extend hours of operation and add add language interpretation services. This year marks the 50th anniversary of America’s community health centers, the largest and most successful system of primary health care in the U.S. Health centers and safety net hospitals are a primary source of care for children and families covered by Medicaid. Health centers are facing growing difficulty providing adequate access to primary care and sufficient capacity given the increasing number of people who have obtained coverage through the Affordable Care Act. In addition to increasing patient volume, health centers are also challenged to take care of an increasing number of people with serious, uncontrolled health conditions, and to handle new demands for better integration of services and technology.